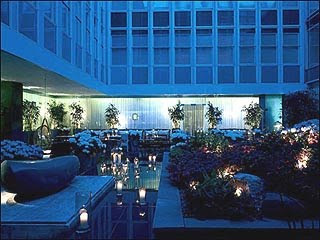 Suka Restaurant @ Sanderson Hotel is located in the heart of the glitzy Soho area of London. B and I had made plans to meet Intan & family at Oxford Station at 7pm before proceeding to our farewell dinner at this classy restaurant. From Bicester Village, we rushed back to our hotel, dumped our shopping bags and spent less than 10 minutes to freshen up before bolting out the door. It was already 7.30pm! We got to Oxford St. a little after 8pm and there were sis, Issy and Ali waiting for us in the cold. Apologies were made for the slight delay before we made our way to this mysterious Suka (or Like) Restaurant. It was sis' idea to have our farewell dinner here; apparently she's been craving for real Malaysian food. We got a little lost, asked a few people along the way and finally arrived at the ultra-modern, ultra-chic 5- Sanderson Hotel. We were greeted by a friendly hostess who led us the way to Suka Restaurant. It looked posh and fancy from the outside and the inside was equally modern. I borrowed this picture below from Sanderson Hotel so you can get a glimpse of the interior. The menu is served in typical Asian sharing style with dishes ranging from home-style to truly elegant. I was expecting a comprehensive list of authentic Malaysian dishes but there was only a small section of our local dishes. More importantly, Nasi Lemak was not on the menu, which I think is a must for any restaurant to be truly Malaysian. Issy was given a high-chair but she was none too pleased. I think she felt like one of us adults after three days of hanging out with us but settled down quickly when she started playing with her dinosaur toy! As mentioned earlier, Nasi Lemak was missing from the menu but there was a side dish of Coconut Rice which sis ordered for Issy. Basically it was rice cooked in coconut milk (I think) with coconut sprinkle on top. Definitely nothing like the NL we have here but nonetheless it was quite tasty. I settled for soft-shell crabs, which I was hoping would taste similar to Fatty Crab's yummy chilli crabs. Of course that was not the case and though still delightful to savour, the gravy could have been more spicy and sweet as opposed to sour and almost tomato-like. Intan who was not feeling well that night decided to try the Bouillabaisse which is basically seafood in a lobster broth. I liked my crabs better but then again, I've never really been into soupy stuff. Ali was wise in his choice with delicious Butter Prawns that were both huge and succulent. If not for the missing curry leaves, this dish would have been a perfect 10! Last but definitely not least was B's Nasi Goreng or Fried Rice. The cheapest choice of the night, it was also the tastiest amongst the five dishes we ordered. Moral of the story? Stick to simple local dishes like Fried Rice and avoid being adventurous like me with a fancy-sounding Terlagi-Lagi dish! That way, you definitely can't go wrong! It was a nice cosy meal albeit a little pricey so we would really like to thank Intan and Felix for treating us again to yet another scrumptious dinner in London. This is a blurry shot of B and me but it's also the only one of us in Suka so this goes into my post as well! Later that night, we took the tube to Intan's hotel. I can't remember the name of the hotel but it was one of those apartment hotels I mentioned in my previous post so it was extremely spacious with a bedroom and attached bath, a living-room, a kitchenette plus a spare room! Issy monopolized both our attention, showing off her new set of toy animals to B whilst reciting the name of each one to us. She pronounced Lion as Wion, which made her all the more cuter and harder to let go when we had to say goodbye. Sis and family were going back to Coventry the next day and B and I had to move to our second hotel in London to meet up with the rest of B's colleagues from TV3 so this was our last night together as a family before parting ways. See my Wion Uncle B! Goodbye baby girl, we love you! After snapping our goodbye pictures, it was time for B and me to catch the last tube back to our hotel and we left a little before midnight with Issy crying as she ran out to follow me and B back home! I would like to take this post to say a special THANK YOU to sis and family for their warm hospitality and company during our first three days in London. We had a wonderful time and we hope to see you, Ali and Issy back home soon! I LOVE all the pictures.. everyone look so happy GP! what a nice reunion! So here it is now, Sweetie! Thanks for sharing. Love all the pics. Baby Issy is just so adorable! I don't think I can go and eat Malaysian food in London! Cos the price of the dishes make me pengsan! LOL!! Some more, the quality of the food surely cannot be as nice as the food in Malaysia. So expensive and not nice = No eat! What?! No nasi lemak? That's a sin! Haha!! So the simplest and cheapest food is nicer like the nasi goreng? Wah B so clever to choose eh? wow, you're so lucky to be able to eat malaysian food while in london. i had a hard time looking for just one malaysian foodie when we were in europe. but all that traveling gives me the opportunity to do one of my fave things, sampling different food cultures. unfortunately, my DH prefers to stick with chinese food to satisfy his picky taste buds. all looks scrumptious especially the soft shell crabs and butter prawns. glad you enjoyed your time in London. the weekend is here dearie. have a great one Marzie! :-D :-D :-D Monica FC1! Feel free to grab a bite whenever u wan LJ, I rekomen the nasi goreng ha ha.. Thank you Shy, I think so too and I already miss her! How come GG? I love la seafood! =-X =-X =-X =-X =-X GG! Monica SSG at dis hour ha ha! Really GG? Hope ur enjoying my vakasi posts then YAY! We truly did LR and I’m only on Day 3 in London for my EE posts here, still plenty more to talk abt ha ha, thanks so much for reading and enjoying my pics! Oh dear I'm soooo late, you're almost done with your London posts and only now I get to sneak view it.